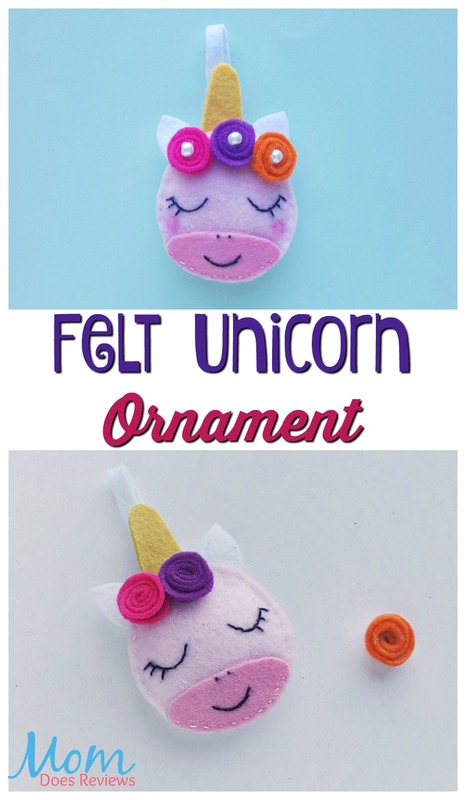 This is a Fun Christmas Craft Activity for any Unicorn Lover! 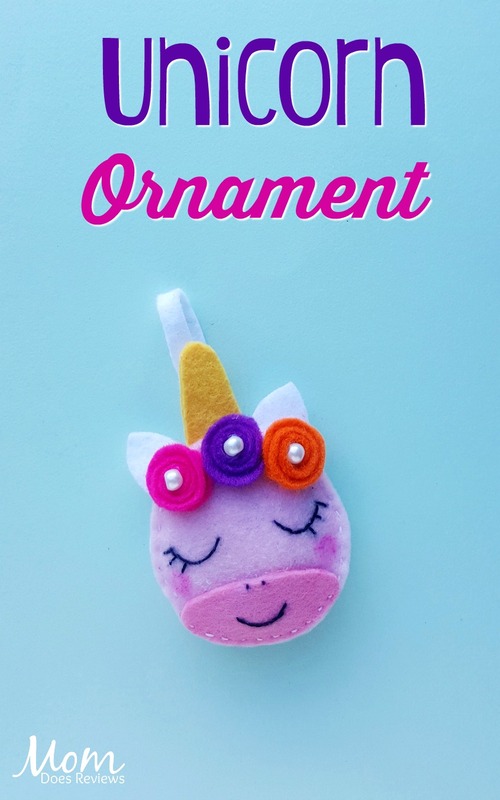 This cute Unicorn Ornament is great for older kids that are learning to sew and have the patience to follow the steps outlines below. 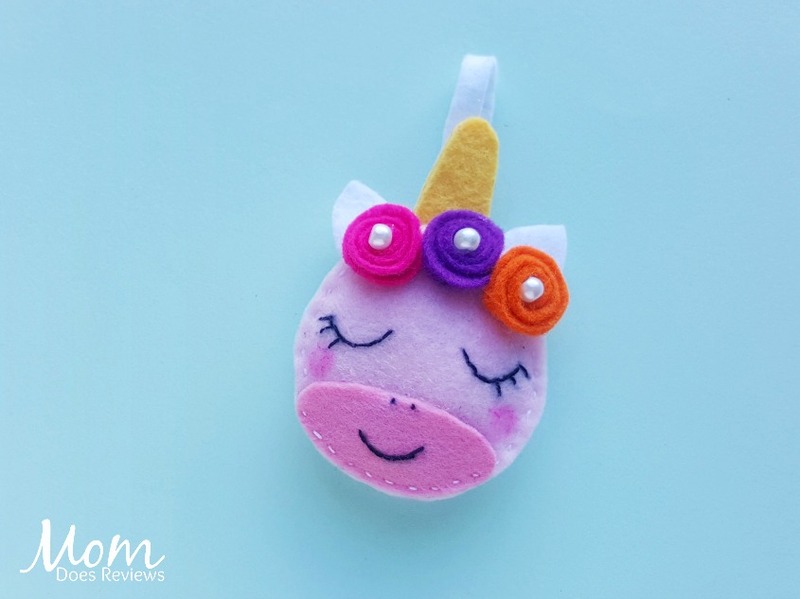 It’s a great activity for tween girls at a Christmas or Birthday Party! Prepare the patterns from the template by printing and cutting them out. 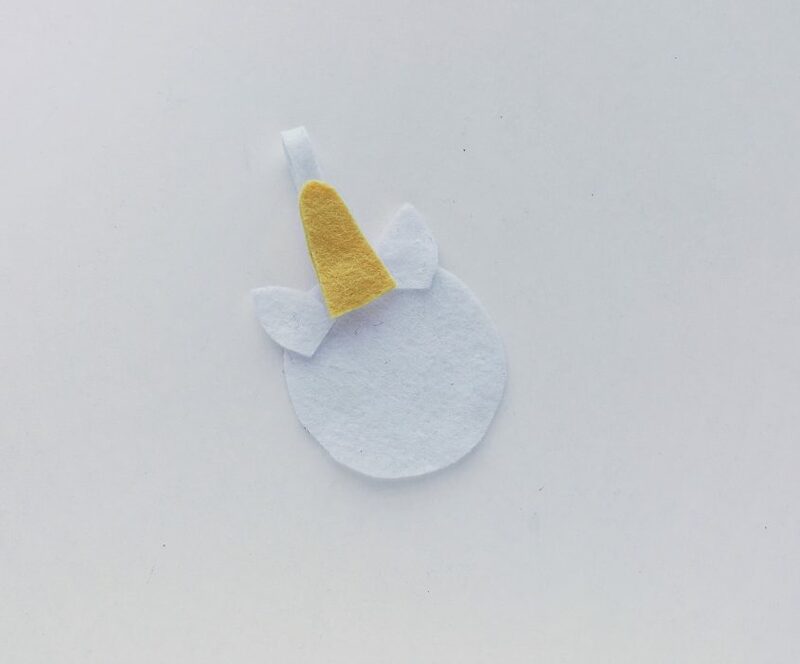 Click HERE to print the template. 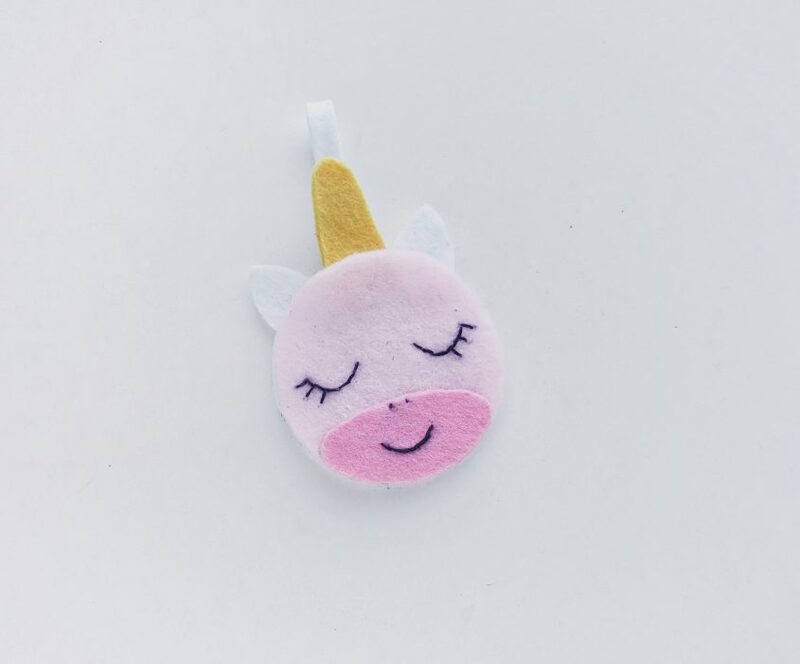 Select the felt fabrics for the unicorn. 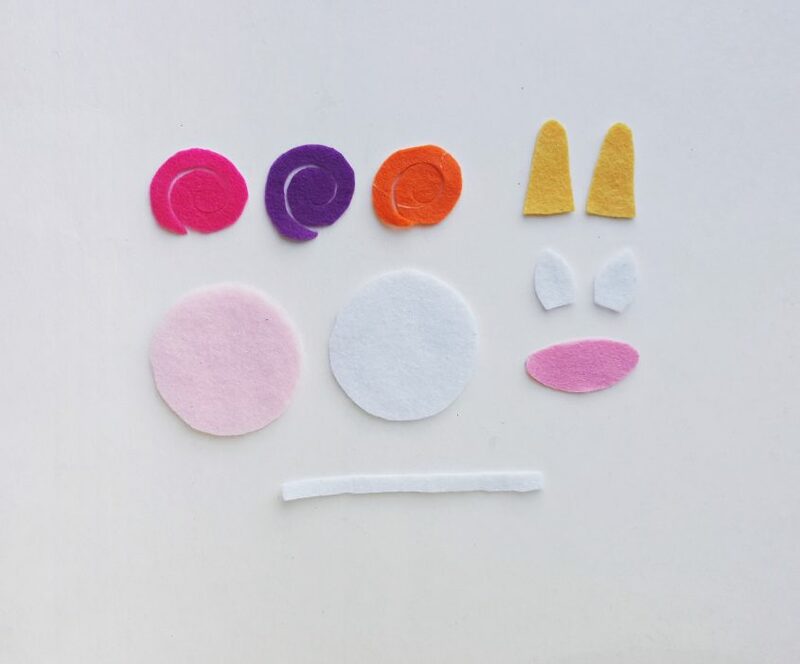 Trace the patterns on the selected felt fabrics and cut them out using scissors. Take a spiral pattern and roll it from its outer end towards the center. Secure the roll by gluing it with the center. 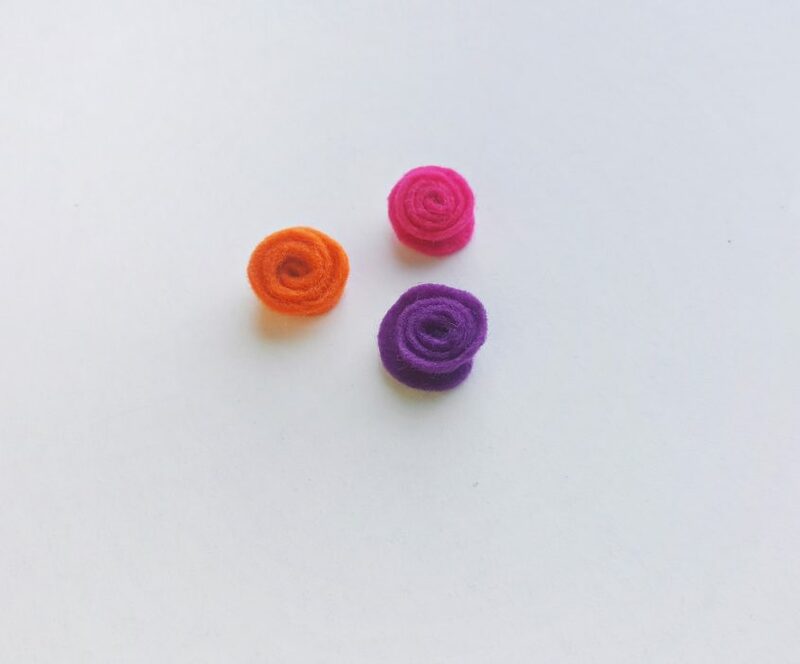 Similarly create rolled spiral flowers with the other spiral patterns. Take any one of the round patterns and the semi circular pattern. Place the semi circular pattern on the round pattern by matching their sides. 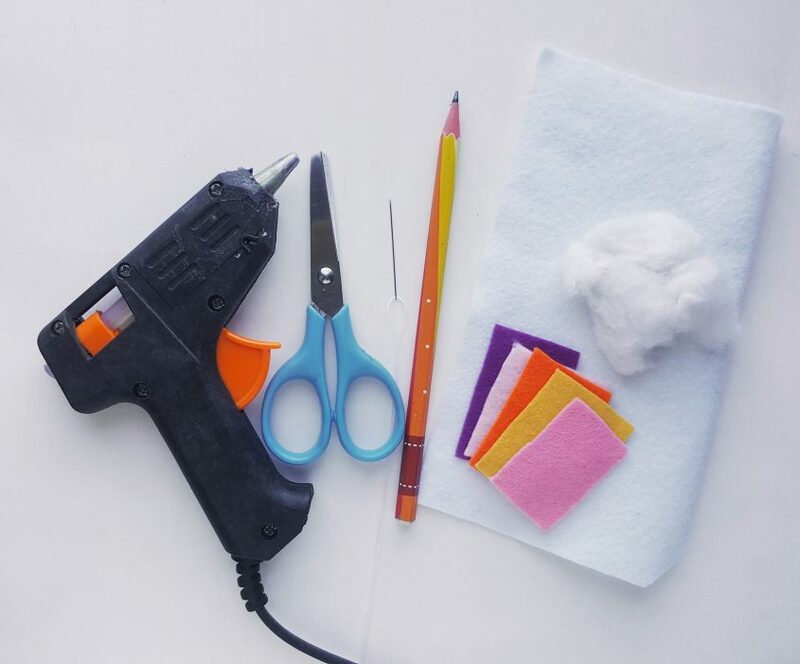 Use hot glue gun to attach both pieces together. 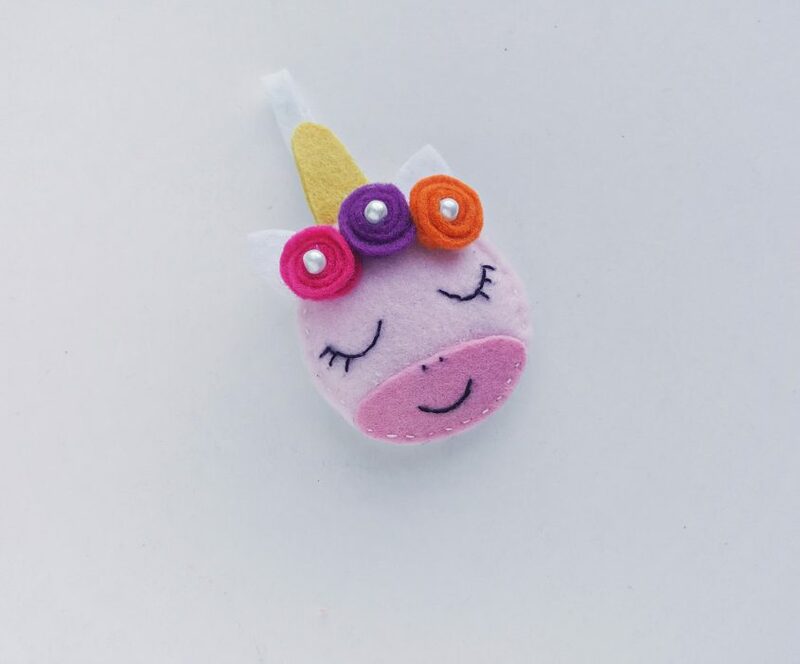 Use a marker to draw the eyes, nose and lip of the unicorn. 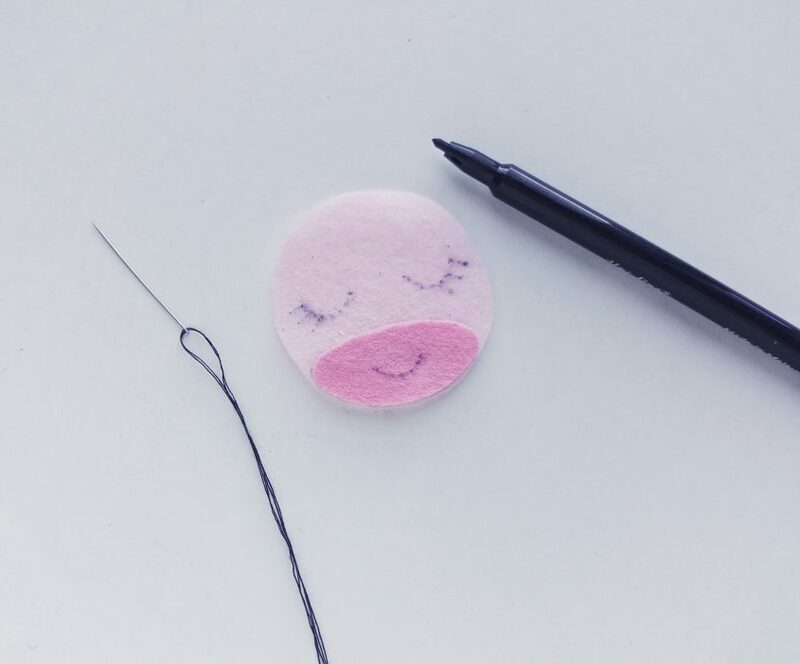 Use black thread and needle to stitch the traced parts from the previous step. 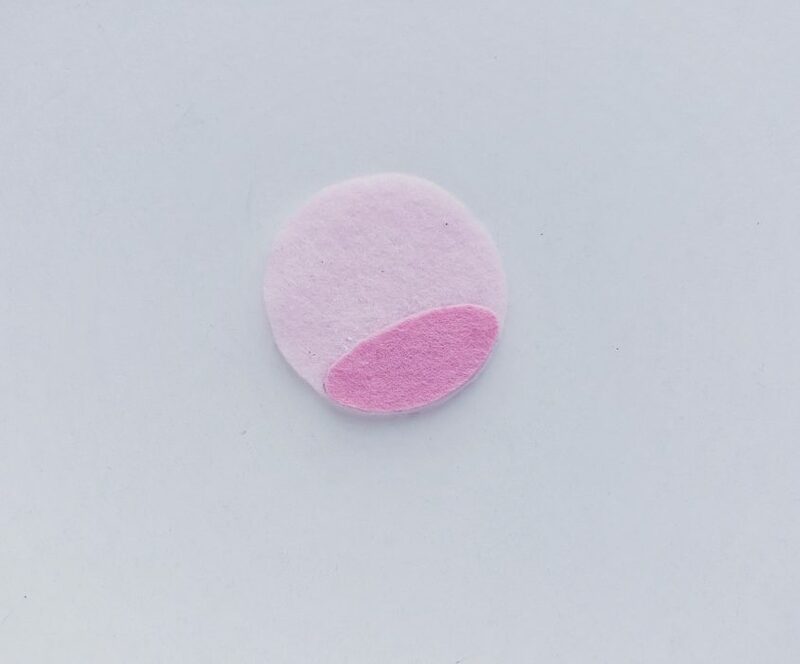 Take the other round cut out and place it on a flat surface. 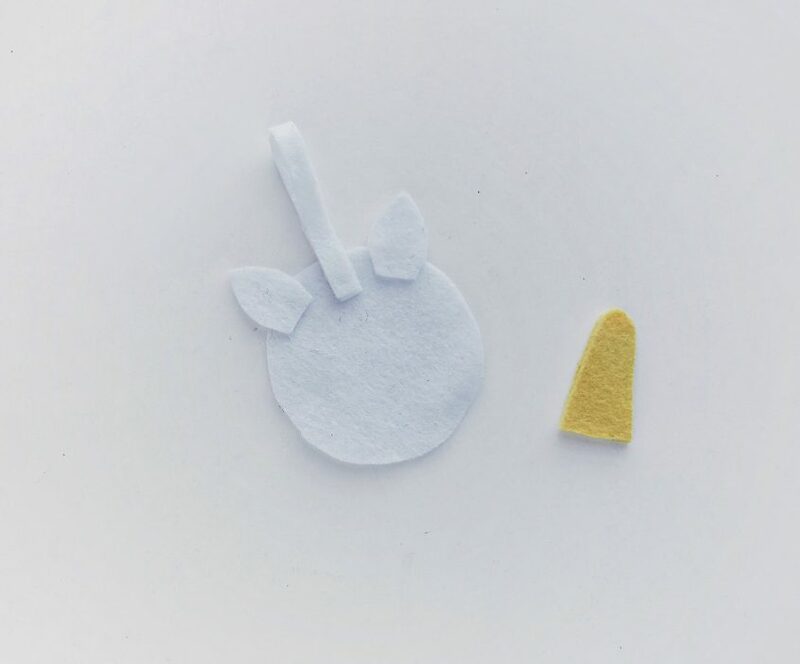 Place the ears on 2 sides of the top end (of the round piece). Take the strip, fold it into half and place it between the ears by overlapping 1 cm of its open end with the round piece. 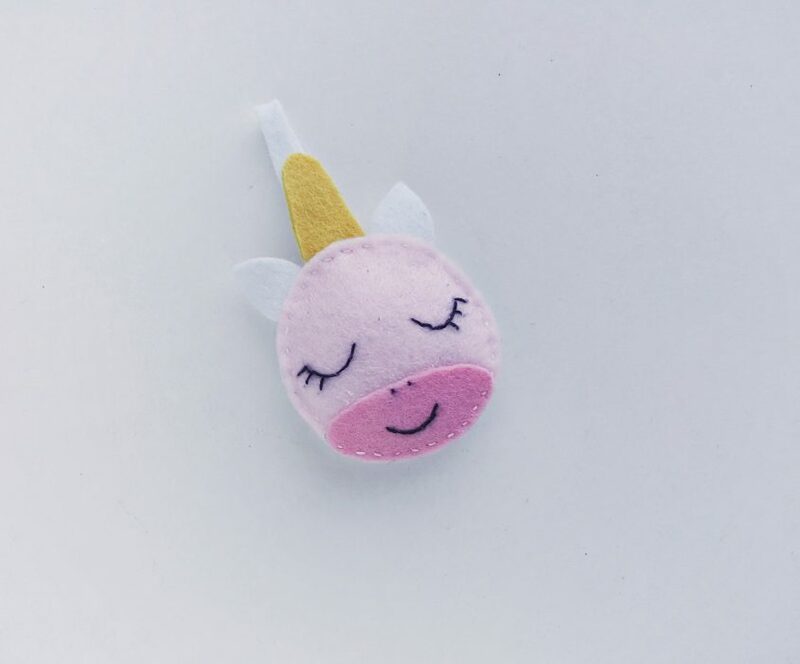 Also attach the 2 horn cut outs together using hot glue. Place the horn on the folded strip, again overlapping 1 cm of the horns straight end with the round pattern. 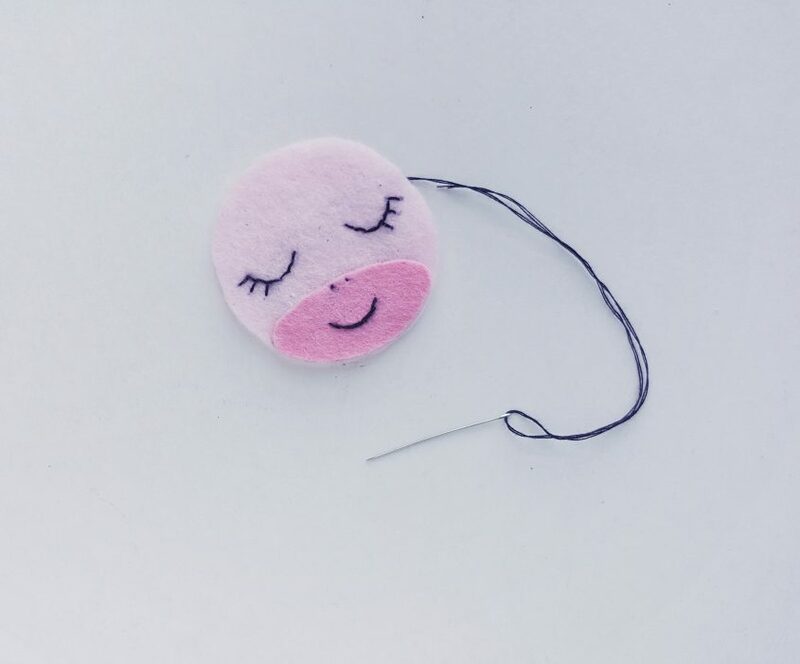 Now place the stitched round piece on the top of the plain one. Make sure that all sides of the 2 round cut outs are matched nicely. 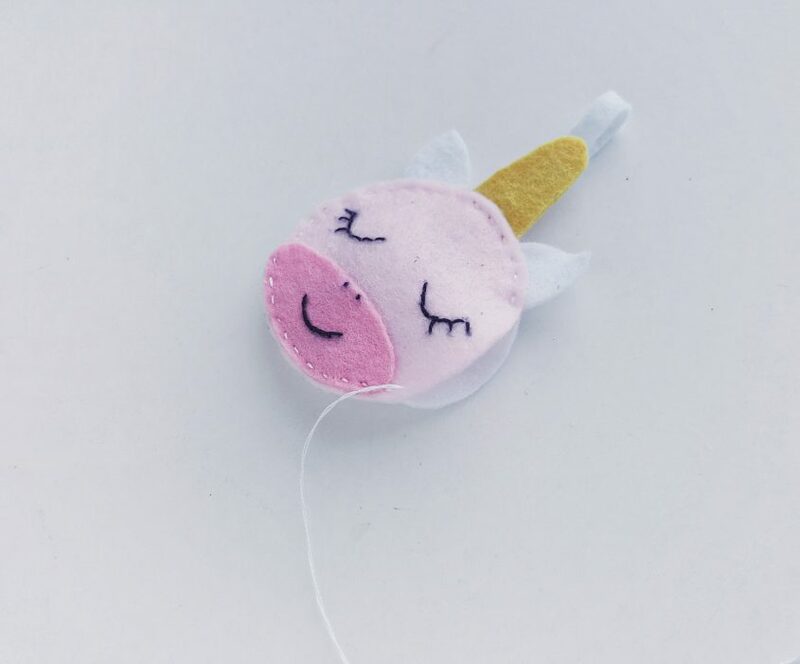 Prepare needle and thread to stitch all items together; start stitching from any one of the ears and stitching along the top side first. 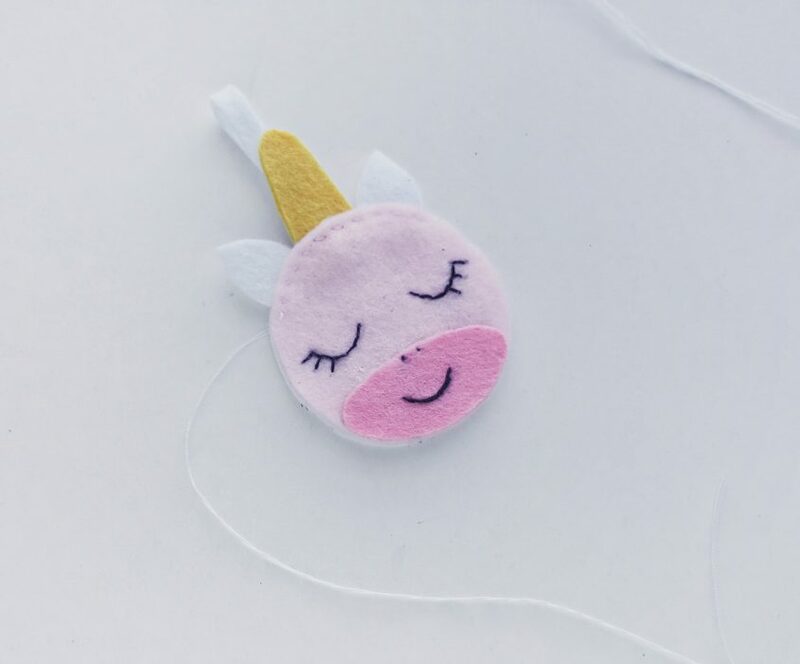 Carefully stitch the top side to make sure that all items are attached together (horn, ears, folded strip, the 2 round cut outs). Keep a small opening before closing the stitch. 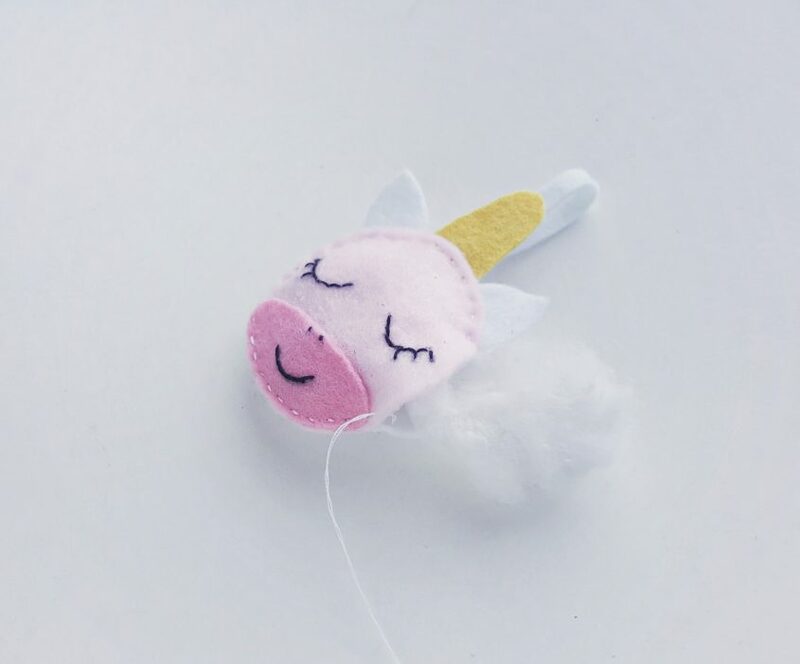 Use cotton to stuff the unicorn through this open end. Done stuffing? Now stitch the open end to secure the stuffing. Tie a knot and cut off extra thread. 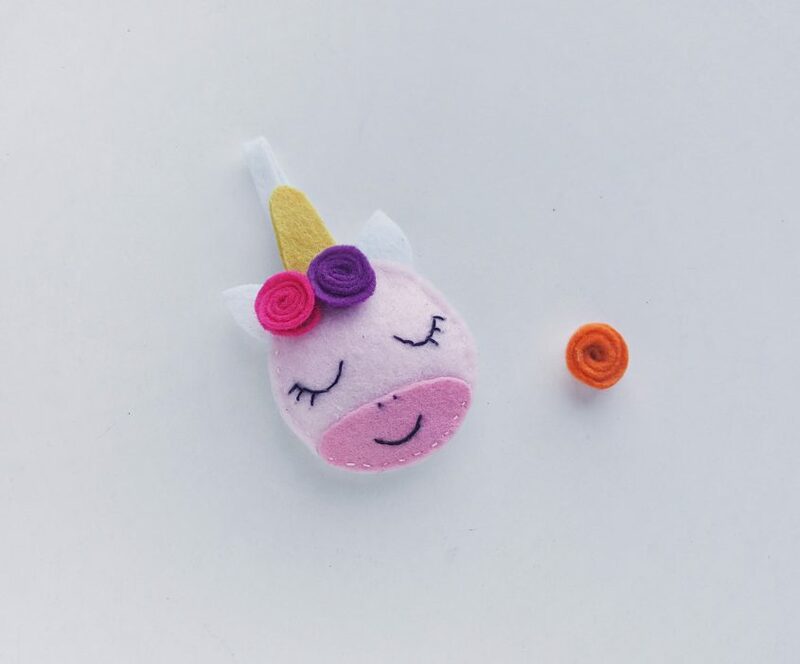 Attach the 3 spiral flowers (from step 2) along the top side of the unicorn. Use hot glue to attach the flowers. Add small faux pearl based on the center of the flowers (optional). You can add more details if you want to and try out different colors for more variation.